Why can't I remove a tag? This is a bug and should be fixed. Here was asked before, and said you need had 2k rep, to bypass the 6 chars rule. But I have 15k so that doesn't work. The question is obviously postgresql. 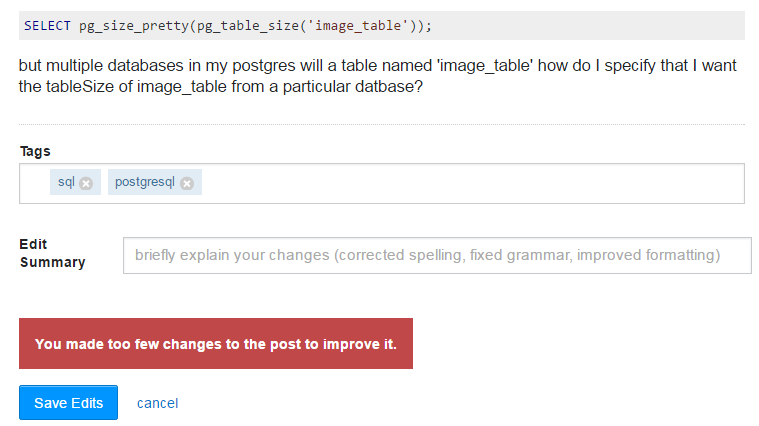 If I try to remove the wrong mysql tag, I have the message saying I made too few changes. Turns out that there was a pending suggested edit by another user consisting of exactly the same as you were trying to do (removing the same tag). Thus the system detected your edit as "no changes relative to a pending change" and rejected it. So, that's by design. But we're going to improve that error message. It's worth noting that this condition will happen only when two users are making the same edit to the same post at the same time; otherwise (pending edits are there when you navigate to the post), clicking the "edit" button will show you the pending edits list for review. Not the answer you're looking for? Browse other questions tagged discussion support bug status-bydesign . How to move a discussion out of chat? What privilege level do you have to be at to add a tag to a question? Why I have to wait 90 mintues more to post a question even though I havn't posted anything? How do I edit a non-spam question that is miss-interpreted as spam?